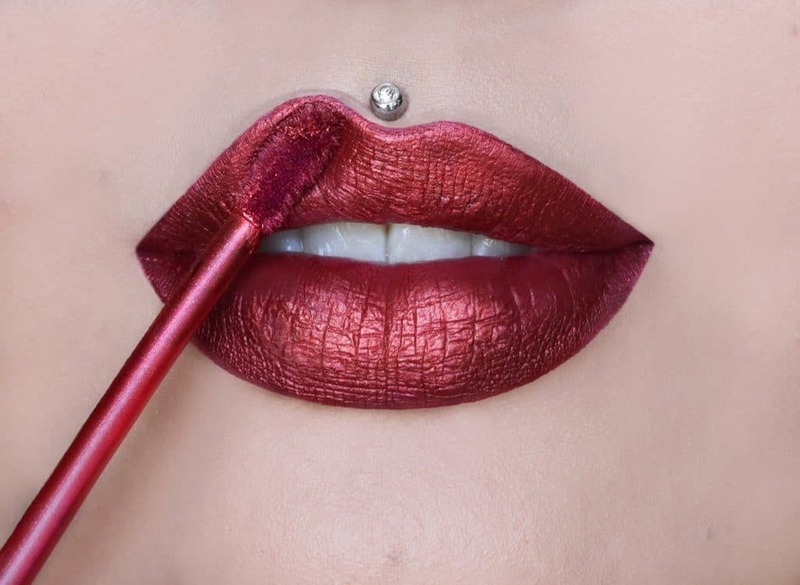 How to Apply Liquid Lipstick Perfectly ! Home ReviewsBeauty How to Apply Liquid Lipstick Perfectly ! To me liquid lipsticks are one of the cleverest creations in the lippy world. With amazing pigmentation, excellent staying power and variety in shade range these lip colours have just become ‘unputdownable’. A perfectly applied liquid lipstick makes the lips appear plum and fuller. Although its application process seems pretty easy at first look, putting together a flawless lip look with these liquid lipsticks are not without glitches. I used to mess up a lot with when I was absolute beginner with liquid lipsticks. But now, I follow a few tricks and my liquid lipstick experience has changed almost entirely. Here are my secrets to get ‘Perfect’ pouts with liquid lipstick in each and every attempt aka- How to Apply Liquid Lipstick Perfectly! Liquid lipsticks, in general, have very drying formula. They tend to make lips even drier with time. That is the reason I make it a point to moisturize my lips as many times as I can if I am planning to apply liquid lipstick. Trust me, it makes all the difference. When your lips are saturated with moisture, the lipstick won’t be able to get settled into the fine lines of your lips and your lips would look fuller and plump. Ever since I started using liquid lipsticks, I have understood the significance of regular lip exfoliation. When my lips are chapped and flaky, the pigment of liquid lipstick tends to get deposited into those crinkles and the neat result is uneven looking lips. Plus, un-exfoliated lips have layers of dead cell in the surface so the lip moisturizers can’t do their job properly and that gives uncomfortable dry feel to the lips. Liquid lippies work best when the lips are smooth due to proper exfoliation. Liquid lipsticks have heavily pigmented and dense composition. They are made to show the true colour in a single coat. If you go over one place again and again, it might give you crumbly and uneven finish. That is why I never go over one coat on each application. When I was a beginner, I often put 2-3 coats and my lipstick got all dry and flaky in 4-5 hours. I can say I am over with this problem now. Liquid lipsticks take only a few minutes to get completely dry and settled down. A slight bit of touch up after that is okay but a full coat of reapplication gives very undesirable look to my lips. So, if I feel like reapplying my liquid lipstick, I remove the remaining lipstick gently with a baby wipe and then apply a fresh coat. It takes a bit of time but the look you get from this is definitely worth it. Quick drying formula is the main feature of liquid lipsticks. You can’t rub your liquid lippy again and again in one place. But, it is really difficult to trace the steepest corners of my lips in one go. So, I always define my lip contour with a lip liner beforehand and then do an even coat of my desired liquid lipstick. I have medium pigmented lips. Lip liner balances out the tone of my lips and the liquid lipstick, I am applying over it, is able to show its true colour. Most of the liquid lipsticks have inbuilt doe-foot applicator wand. This wand is often of good quality but applying dark colours with these wands gives me streaky finish. So, I use my own lip filler brush with liquid lipsticks. Lots of makeup artists both on Youtube and in real life prefer flat filler brushes in place of doe-foot wands when it comes to liquid lipsticks. Pursing the lips is perhaps the most common way to spread the lip colour. This trick works for lip glosses, traditional stick-form lipsticks or even lip paints but not on liquid lipsticks. The cream or oil based lip colours do not settle down rapidly. When the oily texture is wet, we can purse our lips to get the desired look. But, liquid lipsticks get semi-dry in seconds. Pursing my lips with dry or even semi-dry liquid lippy flakes up the formula and the whole lip makeup becomes streaky mess. Ever since I stopped pursing my matte lip look has improved a lot. How to Do Winged Eyeliner ? How to Get Rid of Fruit Flies FAST ! How to French Braid – Step by Step ! How to Clean White Converse ? How to get Long Nails? Well, STOP Doing These Things! How To Apply Lipstick? STOP Making these Mistakes! How to Remove Nail Polish | Awesome Trick for Removing Glitter! How to Use Aloe Vera on Face? How to Get BIGGER Lips? How to remove Mehendi from Hands! How to Use TURMERIC for Beautiful Skin? How to Choose the RIGHT Face Wash? How to Use Castor Oil to Get Longer and Thicker Lashes Naturally – Step by Step! How to Choose the Right Foundation? A Simple Guide ? How to Deal with PCOS- Rocking Remedies !! How To Make Your Hands Look 10 Years Younger: 4 Simple Home Remedies! How to USE Lemons for Skin Lightening- The Right Way !! Wow..These tips are great. Definitely will follow these..